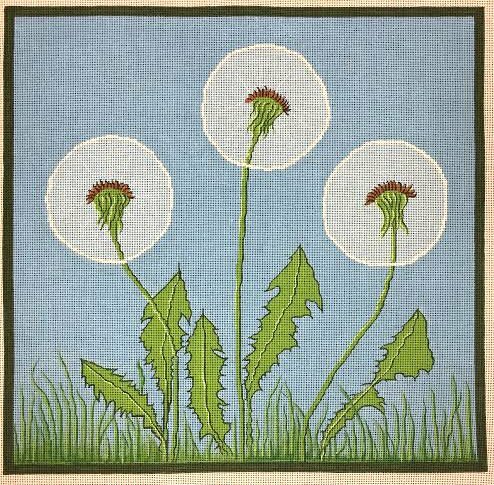 This contemporary Dandelions needlepoint design is handpainted onto 18 mesh Mono Zweigart needlepoint canvas. The original design is by The Red Thread. The design area measures 15" x 15". This Dandelions needlepoint design features a sky blue background and green, gold and white accents. Sold canvas-only or with fibers. if you select cotton we will send DMC embroidery floss; if you select silk we will send Planet Earth PepperPot silks. Wool is Brown Sheep Waverley. If you require stretcher bars we recommend two pair of 19". Contact us if you have any questions about this Dandelions needlepoint canvas. We are always glad to help.